Hyperspectral camera could allow UAVs to detect hidden weapons and chemical agents. 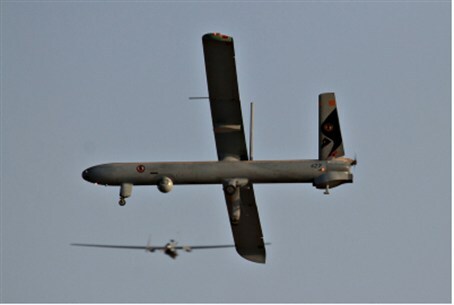 The Israel Air Force is currently examining hyper-spectral camera technology, which could allow unmanned aerial vehicles (UAVs) to collect a wide variety of information, some invisible to the human eye, the IAF Website writes. Among other things, the camera could identify hidden weapons and underground bunkers camouflaged with vegetation. "The camera will alert its operator regarding the location of suspicious targets and even of spots that are saturated with chemicals and other substances," Lt. Col. Yoav, chief of the Intelligence Department of the IAF's Equipment Squadron, told the website. "Its mode of operation is based on sensing the wavelengths invisible to the human eye that are emitted by different substances in nature. Every natural substance emits waves at lengths that are unique to it, and the camera can tell the difference between them because of its high sensitivity," he added. If, for instance, a bush appears to emit abnormal wavelengths – it could be a sign that something is hidden beneath it. Airborne hyper-spectral cameras already have civilian uses, and serve to identify pests in fields, environmental damage and air pollution. Experiments are currently underway in order to examine if the system is suitable for use by the IAF. If approved, the cameras will be integrated into the UAV squadrons, following an extensive training process that will be conducted by professional engineers.